Jacques Brel embodied his era; his musical style, evocative of a philosophical rat-packer, fitted perfectly with the picture of France seen through the envious eyes of those in the grey, dreary England of energy rationing and emergency IMF loans. For those with intellectual pretensions, how could the Paris of the 1968 student revolt, Godard and the new-wave and, of course, the Satre-quoting, Gauloises-smoking, coffee-shop inhabitants of the left bank, possibly be resisted? The extent of the obsession with France shouldn’t be underestimated and Brel came to personify the music (and, yes, he was actually Belgian but no matter). This obsession may explain the staggering fact that, after being scheduled for a two-week run in Cleveland in 1973, this show ran for more than two years and over 500 performances. However all things must pass and interests move on to the next big thing. Brel has become something of a forgotten man, and nowadays I am not sure how many people under 40 have heard of him. One might suggest that the producers have taken rather a risk on reviving this rather curious show; would people who have never heard of Brel be interested in coming to see it, and would those who like Brel want to see his songs be reinterpreted through a musical revue? These are tough questions but one of the answers lies in the talent of the performers. 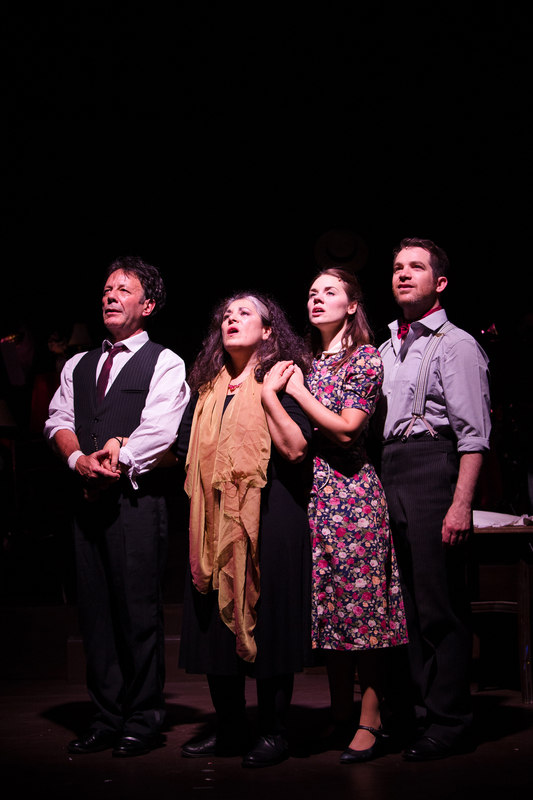 This is an opportunity to see a West End cast in an atmospheric and intimate venue. Gina Beck has previous as Glinda in Wicked, Daniel Boys came to prominence in the TV talent show, Any Dream Will Do, whilst David Burt and Eve Polycarpou are veterans of stage and screen. Watching up close you are reminded of the range and subtlety that West End stars possess – items that can get lost by the demands of performing in a 1000 seat venue with full-on technical wizardry. Brel’s songs require sensitive handling. The emotions are written into the lyrics and carried by the music. Performers need to be able to tell the story and not just let the music guide the audience on how to feel. This does lead to a criticism, which is that the production feels the need to mic its cast. The Charing Cross Theatre is an intimate venue, and a small band provides the music. They actors must be capable of hitting the back row without technological support and the problem with amplifying a small venue is it creates aural illusions; you are close enough to the actors to know where sound should come from only to have a vocal arrive from a speaker placed elsewhere. This was particularly evident in If We Only Have Love where they move around cabaret tables but the sound clearly came from a fixed point. The other issue with amplification is the flattening of sound. Brel is suited to this venue precisely because he was able to marry intensity with intimacy. The cast are extremely good but they would get even closer to conveying the power of Brel’s songwriting without mics. There are no real weak links among the cast; each of the actors brings something different to the songs. In Eve Polycarpou’s case it is an impressive display of lung-busting power that almost takes the roof off the building and gives the trains that rumble overhead a run for their money. As might be expected there is a sheen of West End polish in Gina Beck’s and Daniel Boys’ performances. 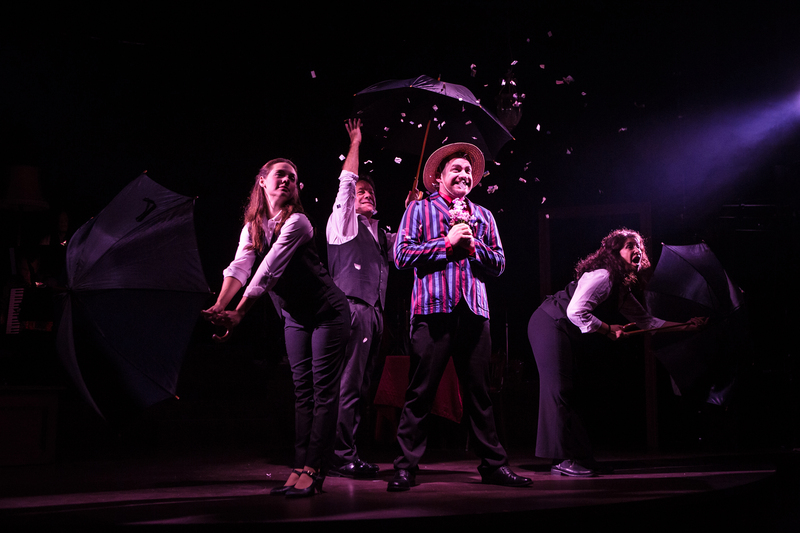 However they have avoided the anaemic glossiness that infects many commercial musicals and it is nice to see actors having fun in the roles and building a strong on-stage rapport. Beck in particularly seems to be having a ball moving between songs like Timid Frieda and My Death – which has a most unexpected but definitely welcome prog-rock score that sent this reviewer whirling back through the years to a university obsession with Dreamtheatre. However star of the show is Daniel Burt. A seasoned performer –a wonderful Zangler in Crazy for You and popping up in last year’s Kiss Me Kate at the Old Vic – he effortlessly steals the show from everyone else. Looking like a louche and dishevelled Robert Downey Jnr, Burt captures some of Brel’s essence and with Amsterdam, which closes is the first half, gives an absolute barnstormer of a performance that even begins to ape Brel in his pomp. There is no point in talking about a plot – there is a very loose narrative around war in the first half and the second half seems to focus on death, but it is all rather immaterial. This is a musical revue not a musical. It is an opportunity to revisit Brel’s musical legacy in the company of some fine performers and a well-oiled band. I remain unsure of who the show is for but as a curio it is definitely worth checking out. It has a rickety, odd-ball charm and is not really like anything else at all. Rather like Jacques Brel really.